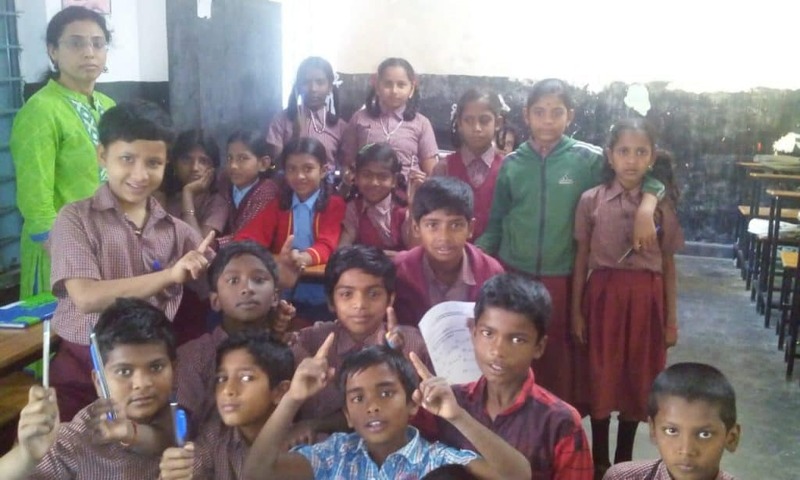 When Shobha Suryanarayan, a volunteer with Acharyas for a Better Community (ABC), first approached Vijayanagar Lower Primary School in Whitefield, the students could barely string together a sentence in English. The school had over 50 children from classes 1 to 5, but there was only one teacher and a headmistress (HM) to teach all of them. Children in classes 1, 2 and 3 would sit together; they were taught by the HM once she finished her official work. Children in classes 4 and 5 would sit together, and were taught by the other teacher, says Shobha. 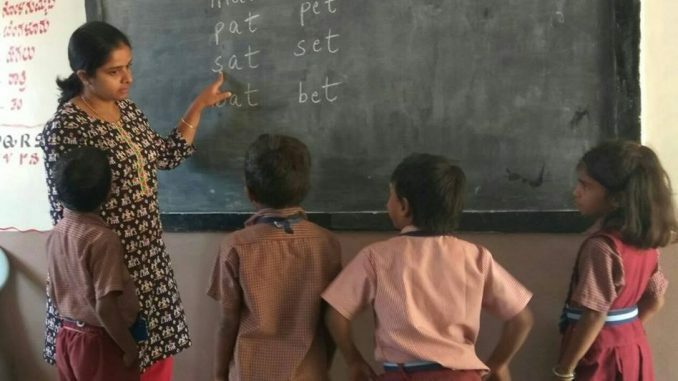 ABC, an NGO based in Bengaluru, is driven by volunteers who go to teach in government schools. They also get CSR funding to meet each school’s individual requirements. At Vijayanagar school, the teachers asked ABC to take over English classes. In last November, ABC appointed a full-time teacher in the school, whose salary is paid with CSR funds. Within just three months, there was a huge difference, says Shobha. “The students spoke in English, and even performed a skit in English. When I first had gone in, they had no idea about sentence structure,” she says. ABC also appointed a janitor since students themselves used to clean the school, including its toilets, up till then. ABC is also refurbishing the school, and setting up a peer lab and library there, with CSR funds. The group had collaborated with the citizens’ movement Whitefield Rising to procure CSR funds, monitor construction work and remove hurdles that came up. “We have built a dining area and washing area for the kids. The ground has been levelled and cleaned up so that children have a safe place to play. We also raised the compound wall and put up barbed fencing to prevent anti-social activities that used to be common in the school premises at night,” says Shobha. CSR funds also cover students’ breakfast, which has resulted in both higher attendance rates and better attention span among students. Overall, the school has got Rs 40 lakhs as CSR funds so far. ABC is one among the many volunteer-driven initiatives in the city that’s changing government schools, one at a time. In addition to registered trusts like ABC, there are also informal volunteering groups, like one led by Anupama Harish in Malleswaram. The shortage of competent teachers in government schools, lack of functional infrastructure, and difficult familial circumstances are causing many students to perform poorly in schools or to drop out altogether. Many low-income families also spend a large part of their income to send their children to private schools, in hope of better education, especially in English. However, studies show that low-income private schools are hardly any better than government schools in terms of learning outcomes. It’s in this scenario that volunteer interventions are strengthening the public school system in Bengaluru. Many volunteering organisations start off without much of a plan. Malleswaram volunteers had come together when local resident Anupama Harish proposed her idea of volunteering in the ‘Malleswaram & Suttha Muttha’ Facebook group. Of nearly 12,000 members in the group then, many responded. Since 2015-16, Anupama’s team has been teaching Mathematics in the Malleswaram 18th Cross Boys’ High School. The group has three volunteer-teachers for Maths each in 8th, 9th and 10th standards. Each teacher picks a favourite topic in Maths to teach – algebra, geometry etc. At any time, the group has 10-15 volunteers. The school initially asked Anupama to get the permission of the Block Education Officer (BEO). The BEO was happy to have volunteer-teachers since the school had teacher shortage, especially in Maths. Maths was also the subject in which majority of the 10th standard students had failed in the previous year, in board exams. After discussions with the school’s head teacher, the group got a timetable. From this year, they have also been teaching Social Studies here. The team has developed a structured syllabus. They also update their progress in a common document so that there is no overlap in what’s taught. Having a structured syllabus is important since volunteers may otherwise teach random topics, concurs Jayashree Narayanan, who was a teacher-volunteer with the NGO OBLF (One Billion Literates Foundation). Jayashree, by her own initiative, had approached Kaikondrahalli Government School a few years back, interested in being a volunteer-teacher. She then became part of OBLF, which signed MoUs with the schools to allow its volunteer-teachers there. Jayashree then found interested volunteers through her personal networks. 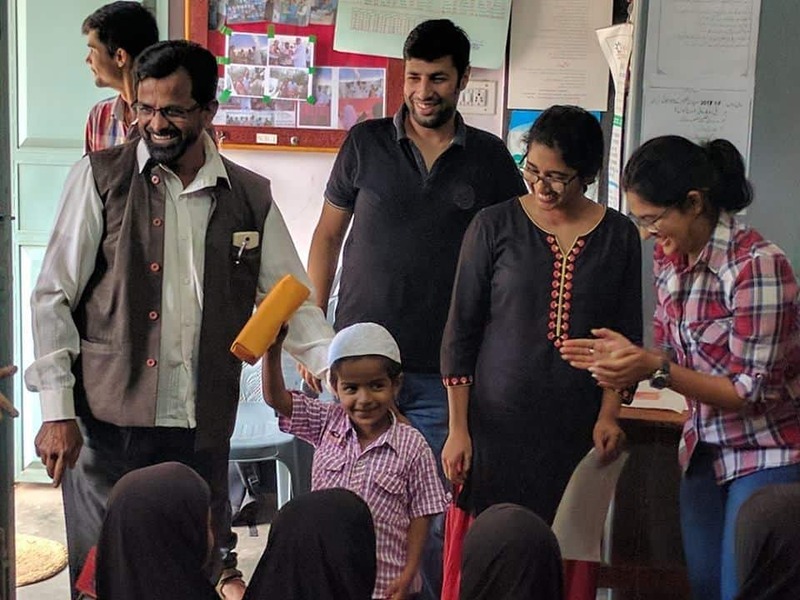 OBLF volunteers have worked with five schools in Sarjapur Road area so far, but the volunteering has been stalled for this year because of the lack of committed volunteers. Jayashree plans to resume the programme next year. OBLF volunteers start off the academic year by assessing students on spoken and written English. “So we know where the kids stand, and we teach them from that level. We give another assessment at the end of the year to see how far the kids have progressed,” says Jayashree. The team gets only a one-hour slot in a day. Usually there are two volunteers teaching English in each grade – one teachers three hours and the other two hours per week, so that there is continuity. Jayashree says schools have been open to them since they come from a registered NGO, with proper permissions. ABC had started informally in 2016, as a group of 10-15 people. They initially had difficulty getting CSR funds, but this changed with their success in Pattandur Agrahara School. In late 2017, ABC registered as a Trust since corporates would fund only formal entities. Currently the NGO is a loosely structured organisation with a CSR group, operations group, social media group etc, all driven by volunteers. The organisation has about 50 volunteers in the city, and has worked with around 20 schools so far. ABC starts engaging with a school by holding sports or art events, or by donating school bags etc to the students. During events, the team identifies the requirements of the school by talking to teachers and students. “When we hold an event, they understand that we are serious. We list down requirements and create a proper project for the school,” says Vikas Chandra, co-founder of ABC. The requirements are put up on ABC’s Facebook page, where people interested in volunteering or donating respond. The NGO also approaches corporates for CSR funds to do building repairs, set up new infrastructure, appoint teachers, distribute bags to students etc. It takes a good deal of time and effort to get CSR funds approved, says Chandra. Volunteers say that working with high school or PUC students is more difficult as they often lack basic knowledge in subjects. Brijesh of the Malleswaram group says teaching 10th standard students was an uphill task. “They didn’t even know basic maths such as addition and subtraction. But we made sure that students who would come to 10th standard from 8th and 9th standards would get the basics right,” he says. Working with primary school students is more fruitful than working with high school or PUC students, opine volunteers. Younger children are more receptive to learning, and can get a good foundation at the appropriate age, they say. “We want to enter the primary school sector now. If we strengthen the basics of primary school children, teaching high school students will become easier for our own volunteers,” says Anupama. Many students also come from very unstable backgrounds, such as abusive/alcoholic fathers, along with socio-economic backwardness or migrant nature of parents jobs. They need to be motivated to study, say volunteers. Schools get very little amounts for annual maintenance, and hence lack essential stationery materials and staff. In some schools, toilets are locked up or students are made to clean those due to the lack of cleaning staff. “In a class of 30-40 students, only 10-15 would really want to learn. The other children don’t even want to come to school,” says Jayashree. Coordinating between volunteers and schools is a challenge for volunteering organisations. Volunteers come from varying backgrounds, but most are homemakers or working professionals. While homemakers are available to volunteer on weekdays, coordinating with professionals on their time slots at the school can be a challenge. Negotiating with the school to get good time slots for teaching, having the school not cancel a time slot randomly, and having committed volunteers who go to the school regularly, are all challenges. Most volunteer organisations ask its members to commit to teaching in a school for at least a year. The volunteering system acts as a self-sustaining system, where the interested, committed volunteers stay on their own. Volunteering groups say that most volunteers who stay on are well-qualified and passionate about teaching. Some volunteers at ABC circumvented this problem by taking a six-month course in Kannada to learn the basics. “This leads to a reverse teaching process in the class. Students love that they can teach Kannada to volunteers,” says Shobha. Sometimes, if a student in the class knows Hindi, the child will act as a translator between the Hindi-speaking volunteer and other students. Gaining entry into a school in the first place can be difficult as well. “We struggle with regulatory challenges – BEO permissions, HMs not wanting to cooperate etc. For teachers, it is judgement on their work when we go in. So there is a lot of resistance. Sometimes we bulldoze our way through. But sometimes we find very cooperative and committed teachers,” says Shobha. However, once the volunteers bring about good results, schools are only too happy to have them continue, say volunteers. While volunteers pitching in with teaching, infrastructure support and funds is impactful for that specific school, it is not an institutionalised solution, and hard to sustain in the long run. Systemic changes to the education system need more thought out interventions and reforms, which we shall explore in subsequent stories. This article is supported by SVP Cities of India Fellowship. This is the second part of the series on Quality of education in government schools. Read the first part: What ails government schools in Bengaluru?